The USDA certifies that organic foods are grown without the use of synthetic fertilizers, pesticides, and several other chemical substances. Unfortunately, even though something is labeled ‘Organic’, it isn’t always necessarily 100% all natural organic all of the time. Consumers still need to do their research on a certain organic dog food in order to be positive it is in fact organic. 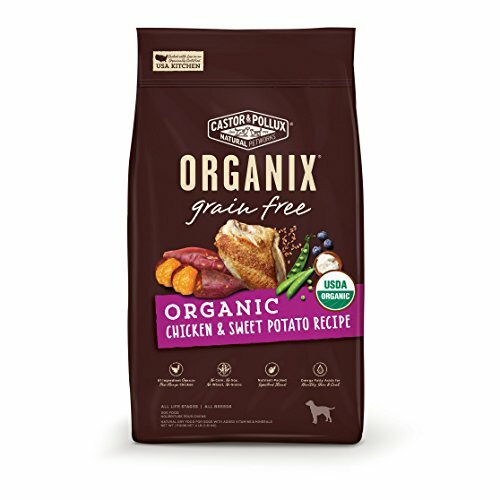 Any pet food can use the term ‘Organic’ when marketing, regardless of how truly organic it is. Organic, non gmo all natural dog foods are becoming more and more popular these days! Pet owners are often settling on these for their safety and nutrient-rich qualities, since they are usually made from ingredients that don’t use synthetic or artificial compounds/materials. Unfortunately, choosing the best food might prove complicated, since manufacturers like to post ‘organic’ on the front of their packaging. To truly be sure, it’s important to check ingredients listed on the reverse side/nutritional label on the back of the packaging. 3. Why Switch to This Food? Why Switch to This Food? If you haven’t figured it out yet and decided to make the switch, you’re probably wondering why to switch to an organic dog food diet. What exactly is the difference, and why is one better than the other? What can the best food give you that others can’t? Below are listed just a few of the many reasons to take that leap and make the change for your pet! Ensure a Natural Diet. These foods, created without the use of any made substances, chemicals, or additives, are about as close to the natural diets any Canine was biologically intended to thrive from. Fewer Health Problems. A Canine’s stomach and digestive system, and in turn your dogs, was designed to consume organically developed/grown foods. All of these GMO’s that are added by man are new to our dogs; they haven’t evolved to tolerate them. Additives and preservatives, even though they may help kibble last longer, can pose risks when stored in the body’s tissues. Amino Acid: Amino acids are the building blocks of all proteins, the combination of determines the protein’s function. This is what protein is broken down to in a dog’s body. Though some are naturally made by a dog’s body, he must attain others from his diet- called ‘essential amino acids’. By-product: By-products are ‘clean’, non rendered, slaughtered animal ‘parts’ other than meat, including things like the lungs, spleen, kidneys, brain, blood, bone, fatty tissue, or/and stomachs. It is important to remember by-products aren’t meat. These are another cheap way for dog food manufacturers to cut costs. GMO: The term GMO refers to Genetically Modified Organisms. Braking this reference down word by word, this includes all ‘once living things’ among the ingredients, whether they be plant or animal, were changed/altered (modified) by humans at a genetic (DNA, Genes) level. The organic dog foods you would be looking for seek to avoid using these GMOs. Rendering: Any number of initial ingredients are ground together and cooked at high temperatures in large, industrial vats, removing all moisture and fat content. The end result is often a concentrated, higher protein ‘meal’. Meat Meal: A ‘Meal’ is a product of dog food rendering, often much higher in concentrated protein vs. the regular form/ingredient. ‘Meat and bone meals’ or generic ‘meat meals’ should be avoided, however, since the owner has no idea what the source is. Bone meal is considered difficult to digest. Specific meals, such as ‘chicken meal’ or ‘beef meal’ are usually considered valuable ingredients due to their concentrated levels of protein. Choosing the best food for your dog is often about recognizing important ingredients, and educating yourself concerning the nutritional requirements of your pet. Remember, many pet food manufacturers include poor quality ingredients in their dog foods in order to save money. Check the dog food ingredients listed on the nutritional label on the back of your dog food packaging/container. Ingredients are listed in descending order based on quantity on a dog/pet food label. Above all, at least one, if not both or all three, of the first three ingredients contained in your organic dog food should be types of animal meat, offering the right kind of essential amino acids dogs need. If the very first ingredient is corn based, or often any other type of plant and not animal product, your chosen dog food is probably plant based and of cheaper quality. 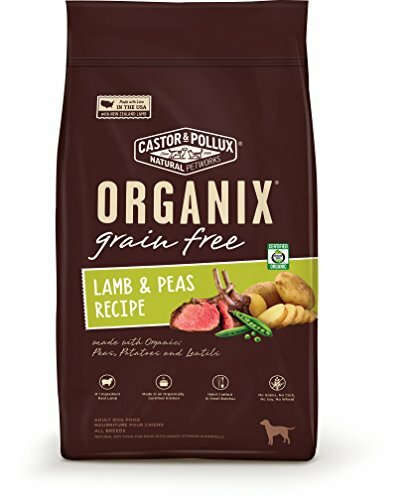 Castor and Pollux Organix is a fantastic all natural dog food, staying true to its organic labeling where so many others don’t. Not only are the very first two ingredients high quality sources of animal protein, offering the right amount of essential amino acids for any dog to thrive, the top ingredient is organic. In fact, seven out of the first 10 ingredients here are organic, and anything after that is held in such small quantities it probably makes no difference. Chicken meal is considered a very concentrated protein source, containing up to 300% more protein than regular chicken. The majority of ingredients here are organic. Top 10 Ingredients: Organic chicken, chicken meal, organic peas, organic tapioca, organic pea protein, potato protein, organic sunflower meal, organic potatoes, organic coconut oil, natural flavor, chicken fat. 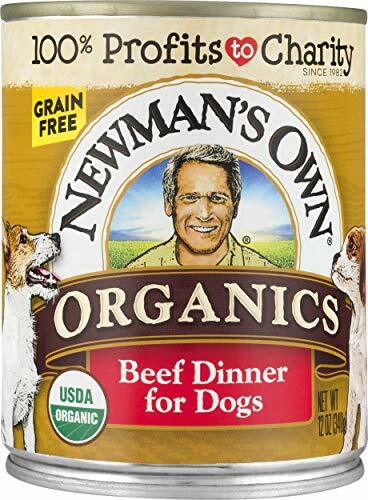 Of all the canned dog foods on the market, you’ll have trouble finding a higher quality one than Newman’s Own Organics! Not only are the very first two ingredients a high quality source of animal protein, the third is a nutrient rich beef broth. If you’re looking for a limited ingredient canned dog food, there’s no need to look further! Top two ingredients are organic. Second ingredient is a highly valued organ meat. Top 10 Ingredients: Organic beef, organic liver, organic beef broth, minerals [calcium carbonate, potassium chloride, ferrous sulfate, zinc proteinate, zinc oxide, manganese proteinate]. Yet again Castor and Pollux have outdone themselves, possibly topping their previous listing here. Switching in sweet potatoes this time, high in both vitamins A and C, they’ve taken a slightly different twist than their Raw Bites recipe above. Organic chicken meal contains up to 300% more protein than regular chicken (which happens to be the first ingredient), easily meeting nutritional requirements for our dogs. Made with vital Omega Fatty Acids for healthy skin and coat. Contains a nutrient packed superfood blending of organic flaxseed, organic blueberries and organic coconut oil. Top 10 Ingredients: Organic chicken, organic chicken meal, organic sweet potatoes, organic chickpeas, organic peas, organic tapioca, organic pea protein, organic sunflower seed meal, organic coconut oil, organic chicken fat. Yet another fantastic organic dog food here, we have a unique twist on ingredients few of the others have even attempted! Not only are fish a great source of nutrients, they are high in omega fatty acids, helping promote a healthy coat and skin. 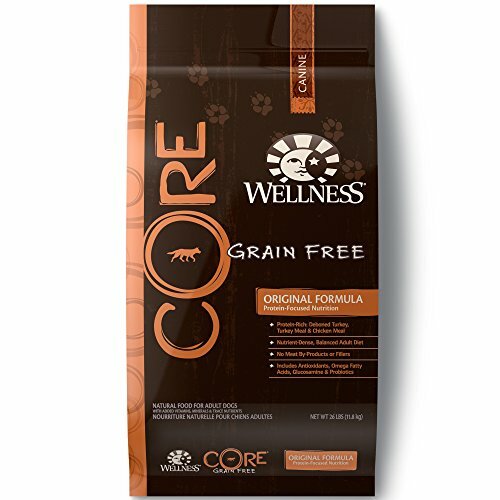 Of course Wellness Core produces some of the best, all natural dog foods available today! 100% grain free dog food, balanced and complete everyday nutrition. Contains all natural, premium ingredients with no wheat, corn, soy, meat by-products, or artificial colors, flavors and preservatives. Top 10 Ingredients: Whitefish, potatoes, peas, menhaden fish meal, chickpeas, dried ground potatoes, canola oil, tomato pomace, ground flaxseed, tomatoes. 1. Are plants (fruits and vegetables) bad for my dog? Some things, like grapes, raisins, or onions, are potentially very bad for your dog. That being said, the plant based ingredients (like corn) found in manufactured dog foods aren’t necessarily bad, but not always good either. Many things, like peas or potatoes, do offer valuable nutrients. On the other hand, in most cases, most plant based ingredients were added to produce a cheaper product. In the end, it costs dog food manufacturers much less to grow their ingredients from the ground, as oppose to process slaughterhouse animals. The question you should ask yourself is: Is my dog’s food animal based or plant based? Remember, dogs are naturally intended to eat a diet rich in animal meat. 2. Can I feed my dog a vegetarian/vegan diet, as long as it is organic? Dogs are natural carnivores, biologically intended to thrive off of animal products and consume animal proteins from animal meat. All the essential amino acids a dog needs are found abundantly in animal proteins, but often very difficult to find in the correct quantities from plant proteins. Because of this, a poorly constructed vegetarian diet will leave your dog nutrient deficient. That being said, it is completely possible to feed your dog a vegetarian diet and have him continue to thrive. It often will need to be carefully designed in order to offer the correct amount of nutrients, usually with the assistance of a veterinary nutritionist. 3. Is an organic dog food diet better than a normal dog food diet? This depends, and the answers will of course vary. A 100% organic (remember, not all are) dog food should be made without all of the many chemicals and pesticides, hormones, or other man made substances used to enhance the ingredients added. Many pet owners would prefer that. Ultimately, the real question should be about the ingredients used. For example, an organic plant based dog food still probably won’t offer near the quality of nutrition a premium animal based food would. A cheaply made dog food is still cheaply made. 4. Why feed canned dog food vs. dry dog food? The main difference between canned and dry dog food is moisture/water content; canned dog food has a higher moisture content. So, the question you should ask is- why or when would I want to feed my dog a food with a higher moisture content? Younger puppies, after they wean from their mother’s milk, should begin switching to a wet/canned food before moving on to dry dog food. Wet foods are very helpful to keep your dog hydrated, if that is a problem. Oftentimes, a dog suffering from food allergies will switch to a limited ingredient wet food. Your veterinarian might prescribe a diet of wet food if your dog is experiencing stomach upset. If you have an older dog that has trouble chewing dry food, a diet of wet dog food is recommended. 5. What is the difference between organic and regular dog food? ‘Organic’ uses ingredients that weren’t grown/raised with the use of man-made pesticides, growth regulators or livestock feed additives. In other words, organic foods can be considered completely natural. 6. Can animal meat, or animal products, be called organic? Organic ingredients aren’t limited to plants, and can include animal products as well. As long as the animals were grown naturally, without the use of growth hormones, artificial man-made chemicals, and were fed from natural materials, they can be considered organic. As a pet owner, we only want the best for our pets. If your looking for the best organic dog food for your little one, or sought to educate yourself a little more about GMO’s vs all natural dog food, you’ve just took some huge leaps in the right direction. Remember, our dogs only have one life to live; let’s keep it the healthiest life it can be!